Do you love chocolate? Do you love peanut butter? Do you love them both even more when they are put together? Then these Chocolate Peanut Butter Cookies are what you’ve been dreaming about. So easy and so good, you’ll gobble them up in no time. For me, these simple chocolate peanut butter cookies were just made for Fall, I think because of the colors. But who am I kidding, they’re yummy anytime of the year! This is such a quick and easy recipe, and you’ll go from start to dunking in milk in 30 minutes or less. Because there is so little measuring involved, these are a great treat for even the youngest helpers to lend a hand with! These cookies are soft and cake like and taste delicious! If you need an easy go to crowd pleaser for a tailgate, classroom party, or any gathering, these chocolate peanut butter cookies are sure to be a hit! It’s a good thing they’re so easy to make, my kiddos eat them as fast as I make ’em! 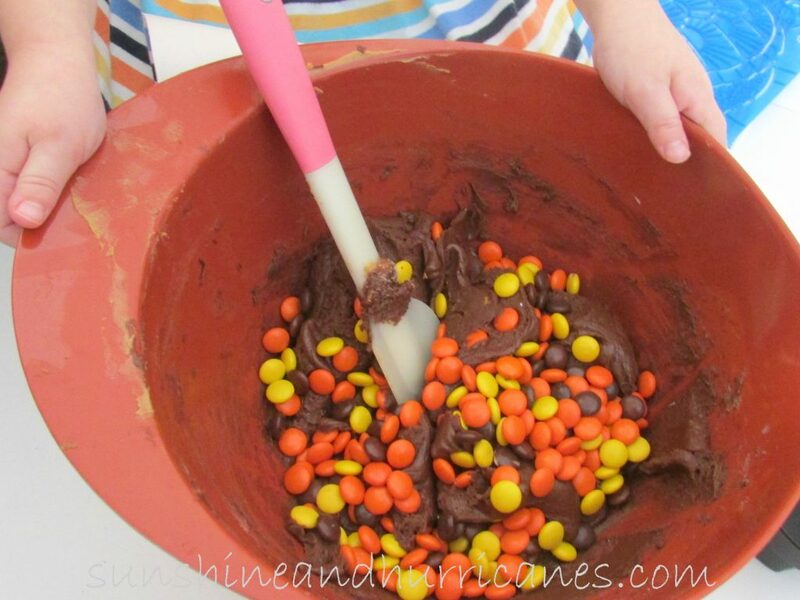 Combine all the ingredients except the candies in a large mixing bowl until well blended. Add candies and mix to incorporate. Looking for other great recipes, like these chocolate peanut butter cookies? Follow Sunshine and Hurricanes ‘s board Cookie Monster on Pinterest. « Card Games for Families – Make It a Family Game Night! Mmm. I could eat a few too many of these. 😉 Hope to see you at Show Me Saturday this weekend. Yum, yum, yum! My two favorite flavors, blended together. Pinning and thanks for sharing at Fridays Unfolded! Chocolate and peanut butter? This is double the pleasure! Thanks for coming and linking up at The Weekend Social. All posts get pinned in our pinterest board! Please be sure to come back next week starting Thursdays at 9PM EST on culinaryflavors.gr ! I hope to see you there! These look so yummy. They would be perfect for our Halloween party later this month! Thank you for sharing on Show Me Saturday! These cute little cookies look amazing! I can’t wait to try this fun recipe with my kids! Thanks for sharing! PINNED! These look SO good! Choco-peanut butter is my absolute favorite dessert!! 🙂 Pinning! The cookies look delicious! Pinned it! Thanks for sharing! These look amazing! I love Reeses Pieces in cookies! Oh my goodness! You absolutely cannot go wrong with chocolate and peanut butter. Yum! These look so good! Chocolate and peanut butter is always my favorite combo. 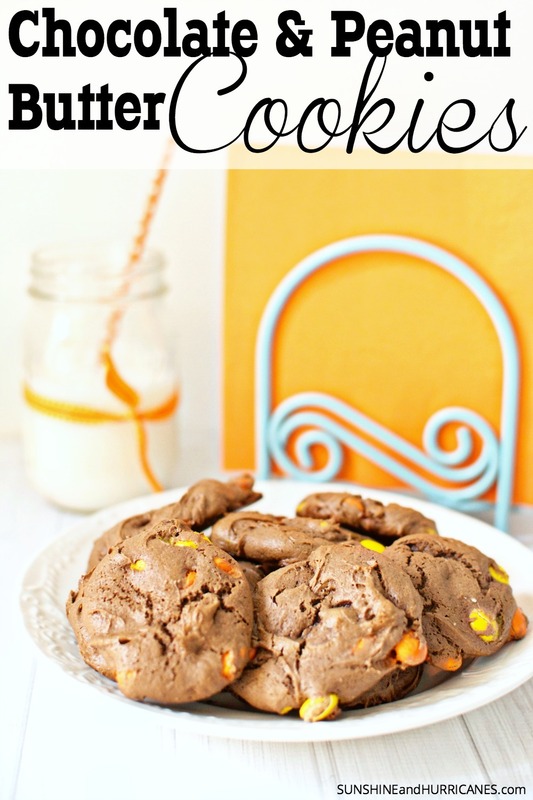 Cake mix cookies are such a clever trick for smart cooks! Love that these are a Fall tradition in your home! 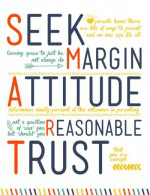 Pinned it, must try! Wow! 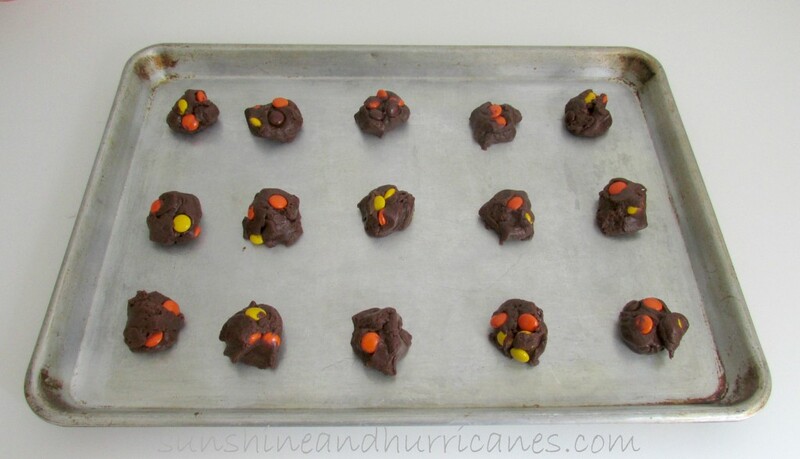 This is a really easy recipe and the cookies look yummy. I’ve never used cake mix for cookies, but it is a really great idea. Ohhh my husband would LOVE these! Great recipe.